Continuing on in the spirit of making goals or resolutions for genealogy in 2015, here are some thoughts I read from Kimberly Powell at about.com. No more excuses! Almost all of us can admit to getting wrapped up in the hunt for ancestors and letting other important things slide (and I am not talking about the laundry). Most of us have notes piled on the floor, shoeboxes full of unlabeled photos, classes we have planned to take, relatives we have been meaning to interview and other researchers we have been intending to contact. If you’re like me and want to take your genealogy research to the next level, choose a goal (or two or three) from this genealogy ‘To Do’ list and get started. Let’s make this the year that we finally get organized and really work on improving our genealogical or family history research skills. It’s Halloween. Don’t really celebrate the holiday any more, but found it interesting that an old connection came back to tantalize and haunt me today. In August, I wrote about a photo found in Hawaii of some of my relatives: The George Brecheisen family. Although I’ve worked off and on to figure out the relationship, I haven’t been successful. It was sitting on the back burner, percolating away. Today the gentleman in Hawaii contacted me about more info he’s found about Amanda Miller, Tillman’s wife: an Ohio death certificate. She died 10 March 1931 in New Philadelphia, Tuscarawas County, Ohio. According to said death certificate, her mother was a Thompson. Great to know her mother’s maiden name. That may come in handy down the road! According to Find-A-Grave, Amanda Miller, along with her husband Tillman, are buried in East Avenue Cemetery in New Philadelphia, Tuscarawas County, Ohio. They most likely lived their entire lives in Tuscarawas County. George’s three older siblings were born in France. But he was born in Ohio, and lived in Green, Ashland, Ohio for the 1860 census. Although Tuscarawas County and Ashland County aren’t next to each other, they are close enough for relatives to have settled in. The Hawaiian gentleman also found siblings of Amanda, including one named Caroline. And on the back of the latest photo it says something like, Aunt ‘Cal,’ sister to my grandmother Amanda Miller. She never married. Cal could conceivably be a nickname for Caroline. I still suspect George Brecheisen and Tillman Miller might be cousins due to the closeness in their birthdates (George – 1855 and Tillman – 1859). But there’s a lot more work to do to prove this theory, to say nothing about trying to flesh out the Miller line further to #1, prove this is the right Miller family, and #2, try to see where the connection lies between the two lines. Maybe a solution to this puzzle that keeps coming back to haunt me will be my Christmas present! A post over on Moore Genealogy called, “A Special Place,” got me to thinking. I can’t recall a special place in my childhood, and even if I did, I wouldn’t have a photo of it. However, I do have special places as an adult I love to visit. I walk the dog, hike, bike, camp, and while exploring the outdoors, I’ve found quite a few special places. It’s on a bike path I visit infrequently. But every time I go there, I am inspired by the beauty and simplicity of the trees which cradle the path. Before I reach this area, there are pines and fruit trees, and tall grass beside the trail. Then there’s a little downward dip in the path and I am gently ushered into such tranquil beauty that I always stop and look upward, as the tree branches direct me to do. After I have gazed heavenward for a while, I look at the path and am always enchanted by the patterns made from the sun shining through the tree limbs. In this photo, they remind me of stained glass…minus the coloring, of course. 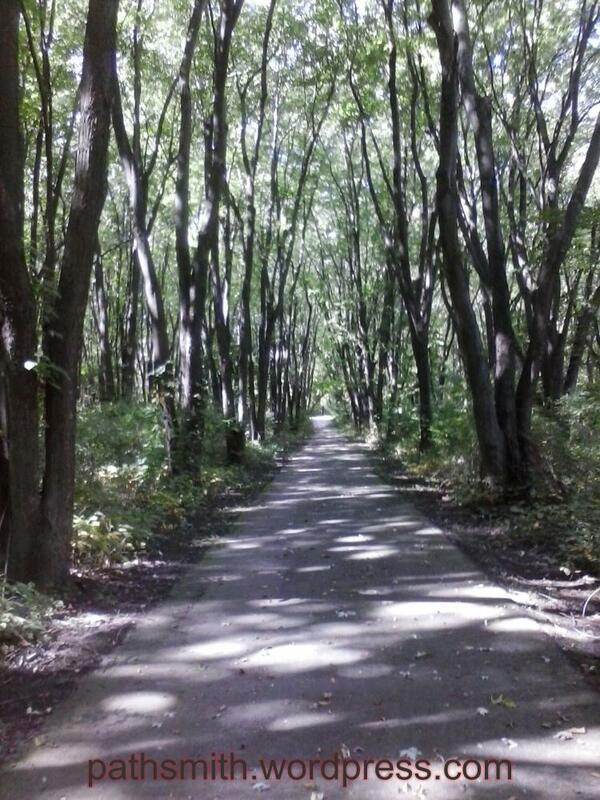 The view down this bike path is awe inspiring to me, and always makes me stop and think about how beautiful nature is. And how frequently we are so busy we don’t stop to appreciate it. When I look at the tree lifting their limbs towards heaven, and how they form a ceiling over the path, it truly feels like an outdoor cathedral. We don’t always need beautiful buildings or stained glass or powerful organ music to hear God. Just step outside into nature…and look, and listen to His creation. 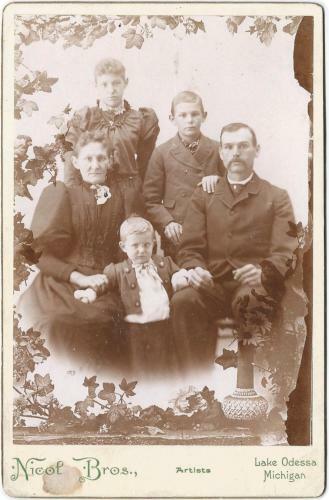 Often I have bemoaned the notion that I don’t seem to have a lot of photos of my ancestors. In trying to come up with a post for today, I thought throwing up a photo would be quick. I started looking on my maternal side of the family and was surprised to see if I go up 3 generations, and go back from there, I have one, , ONE, single photo in my direct line. I’ve always told people I don’t have very many photos in my tree. Now it’s apparent how truthful I have been! How can this be? I remember my Mom dragging out photo albums and going over them with me. I spent many holidays, Sundays, and overnight stays with my maternal grandmother. She also would get pictures out of a drawer, or scrapbooks with her ancestors in them. Where did they all go? Unless there’s a historian or ancestor keeper in the family, they go the common route a lot of photos go. They get lost. Or sold at estate sales, or worse yet, get thrown away. Photos are precious. Do what you can now to preserve them. Make copies and display them prominently in your home. Digitally back them up: in more than one place. Put the originals in a safe place. And don’t feel it is silly to include information in your will about your photos and genealogical information. Thomas MacEntee has mentioned several times in webinars he has specific directions about what happens to his family tree, records and photos after he dies. And now that I know there’s hardly any maternal direct line photos to choose from, I’m off to check out the paternal side of the family. After all, it’s June, the month we celebrate Fathers.